I hope it comes as no surprise that I am obsessed with Washi tape. I have yet to find a project I can't use it for. Since I have an extensive collection (thanks all to my wonderful MIL), it should also come as no surprise that I am prepared for all approaching holidays. 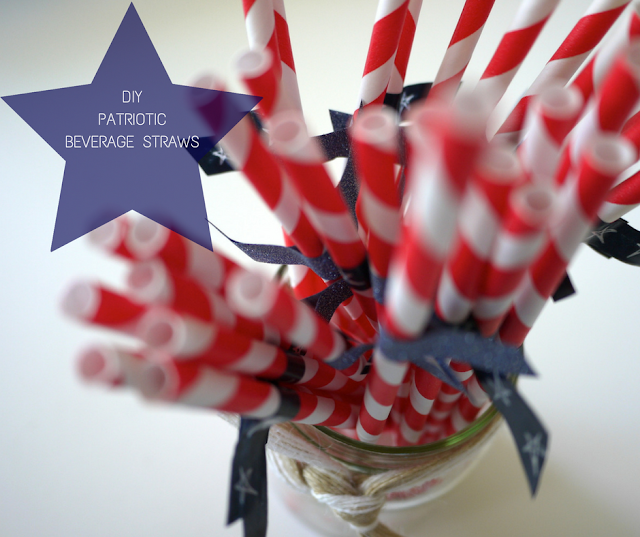 With the 4th of July less than a week away, it is time to bust out a quick craft to prepare for some patriotic beverages! I tend to buy paper party straws whenever I see them on sale, that way I am ready to drop them in a jar should any gathering come to fruition at my Thriving Home. I had TONS of red ones left over from my firefighter themed party a few years ago and I am always thankful to unload some of them. Using a navy star tape and a navy glitter tape, I wrapped a bit about an inch down (leaving room for sipping), gave the ends a little angled snip and I was done. That's right, I said done...collect that brain matter from the wall...I know your head just exploded with how ridiculously easy that was. Into a ribbon wrapped jar they go and set out next to a cool, refreshing summer cocktail they will sit. Ready to add a little patriotic pizzaz to everyone's glass. Too easy and oh so cute! Now who doesn't love a 30 seconds or less craft?! I do, I do!! Looking forward to knocking out a few more fun projects before the 4th...how about you?